Cook is absolutely right here. By providing a platform to Barghouti, the NYT has published a not-so-veiled call for abolishing the world’s only Jewish state and, at the same time, allowed Barghouti to falsely claim that the boycott movement he leads is not antisemitic. Barghouti’s article is entitled “Why Israel Fears the Boycott,” though the URL tells us that the original title was “Why the Boycott Movement Scares Israel.” The answer to this, in whatever variation, is very simple: just like earlier boycotts under the motto “The Jews Are Our Misfortune,” the BDS movement employs similar tactics of slandering the Jews – nowadays the Jews of Israel and those who support the Jewish state – by falsely presenting them to be solely responsible for the “misfortune” of other people, in particular the Palestinians. * Since the long list of lies and slanders Barghouti usually employs when he travels the world to promote the boycott movement has been often described and refuted, I will focus here only on two crucial points that Barghouti tries to obfuscate in his NYT op-ed. The first is that, as far as Barghouti is concerned, the so-called BDS (boycotts, divestment and sanctions) movement is not campaigning for a negotiated two-state solution and an Israeli-Palestinian peace agreement. Instead, it denies Israel’s right to exist as a Jewish state, irrespective of the borders of this state. As Barghouti himself explained, even if Israel gave up its control of all the territories captured in 1967, this would not end the BDS campaigns, because BDS embraces the same rejectionist positions that led to the Arab refusal to accept the UN partition plan in 1947. Barghouti likes to talk a lot about “Palestinian rights,” and while he is careful to use language that conforms to today’s human rights discourse, the most fundamental Palestinian “right” he advocates is the “right” to undo the establishment of Israel as a Jewish state. But while Barghouti and his fellow BDS activists usually feel very confident asserting that Palestinian refugees and their descendants have a unique status and “rights” that no other group of refugees enjoys, they do seem somewhat worried that people might conclude that the boycott movement is, in effect, antisemitic. BDS activists may well have Jewish friends or may even be Jews themselves, but the boycott campaigns they advocate target the Jewish state for being Jewish – as Barghouti himself acknowledges when he says that BDS campaigns would go on even if Israel no longer controlled the West Bank. What is really interesting in this context, however, is the fact that Barghouti didn’t try to prove his opposition to antisemitism by linking to a declaration he signed in 2012. 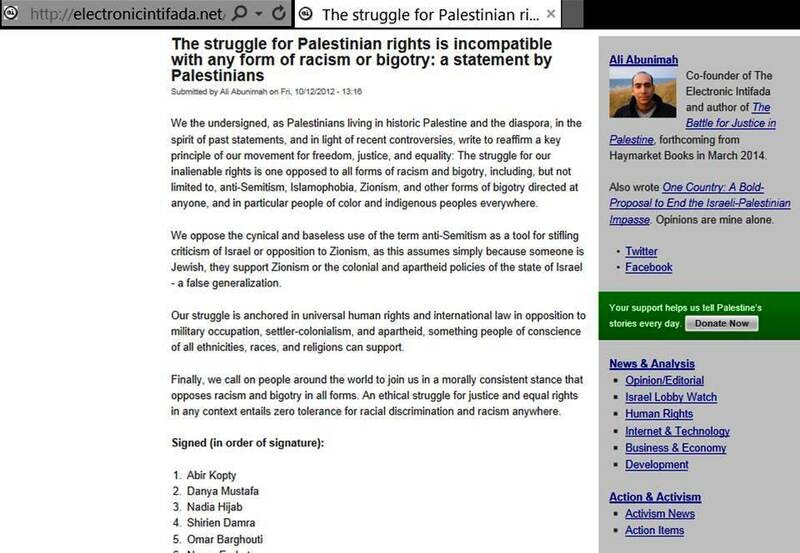 Under the title “The struggle for Palestinian rights is incompatible with any form of racism or bigotry,” this declaration, posted by Ali Abunimah at the Electronic Intifada, asserts that the Palestinian “struggle for our inalienable rights is one opposed to all forms of racism and bigotry, including, but not limited to, anti-Semitism, Islamophobia, Zionism, and other forms of bigotry.” As the screenshot below documents, Omar Barghouti is signatory no.5 on this resurrection of the “Zionism is racism” calumny. While the infamous UN resolution is nowadays widely regarded as an embarrassing part of the Soviet-Arab Cold War efforts to undermine Israel, it is hardly surprising that anti-Israel activists yearn to recreate this effective weapon to delegitimize the Jewish state – after all, in the wake of the UN’s “Zionism is racism” resolution, Zionism became “a metaphor for universal evil” and it was considered perfectly legitimate to boycott Jewish groups or individuals suspected of Zionist sympathies. This must truly seem like the good old times if you are a BDS activist. The inconvenient truth is that as long as BDS activists like Omar Barghouti remain firmly opposed to a two-state solution that would result in the peaceful coexistence of a Jewish and a Palestinian state, their activism has nothing to do with human rights. Try as he may, Barghouti cannot conceal that he is actually campaigning for what he regards as the most fundamental and non-negotiable Palestinian “right:” the supposed “right” to finally achieve what the Arab war against the emerging Jewish state failed to accomplish. The Palestinians who fled this war that was supposedly waged on their behalf have served as pawns ever since, clinging to their refugee status and the illusion that it could be passed on through generations reared in the belief that the Jews of Israel are their “misfortune.” But then as now, their misfortune was the unwillingness of the Arabs to acknowledge the simple fact that the Jews are one of the Middle East’s most ancient peoples who, in modern times, could claim as much of a right to self-determination as the Arabs. People like Omar Barghouti are still unwilling to acknowledge this simple fact and are devoting all their energies to convince the world that Jewish self-determination is the misfortune of the Palestinians and that it is therefore their “right” to insist that the Jews in the Middle East should be forced to once again live as a minority under Arab Muslim rule. This entry was posted in JPost and tagged anti-Zionism, antisemitism, BDS, Israel, media, Omar Barghouti, Palestinian. Bookmark the permalink. “But then as now, their misfortune was the unwillingness of the Arabs to acknowledge the simple fact that the Jews are one of the Middle East’s most ancient peoples who, in modern times, could claim as much of a right to self-determination as the Arabs.” Arguably, given the continuous presence in the land of Jews for at least 3,000 (some would argue 3,500) years, even more of a right. If this is acknowledged, then the “rights” of the Arabs/Palestinians becomes that much weaker. Not that proponents of BDS are ever likely to concede such a point of course. That would fatally undermine their whole, racist, raison d’etre.